Okay, how many of us have caught the aroma of a co-worker's afternoon snack of microwave popcorn wafting through the air vents or walked into the lobby of the movie theater and been hit by the fresh popped corn and exclaim 'ummmm that smells sooooo good!'? 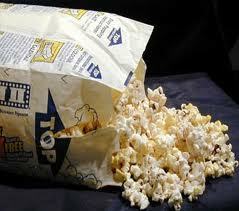 There's just something about hot buttery popcorn that everyone loves isn’t there? 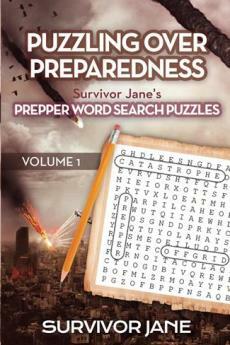 So I thought what a great item to include in you emergency food supply. 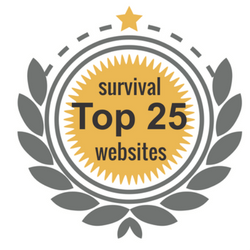 Now whatever you do, please don't ask me how you are going to fix popcorn without a microwave in a survival situation! Making popcorn is nothing new ladies. 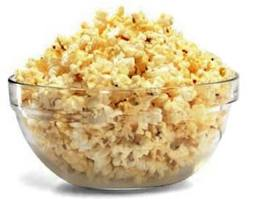 In fact, people have been making popcorn forever - yes and without a microwave. In days of old popcorn was popped with all types of creative containers, from hot stones, to pottery with heated sand and even with mesh wire baskets later on. So I guess you are wondering then how DO you make popcorn without a microwave? Well ... this how I make it (yes I like to make my own sometimes). Stop your whining – it’s actually easy and fool proof if you follow these steps. Okay. Get you a bag of good ol’ fashioned popcorn (hint it comes in a bag with hard kernels in it if this is your first time). Get you a 3-quart saucepan and add 3 Tbsp of oil to it. 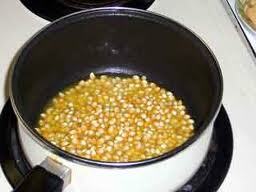 Then, add 3 or 4 popcorn kernels to the oil, cover and heat on medium-high. When you hear the kernels pop, (they’ll hit the top of the lid and make a clinking sound), add 1/3 cup of popcorn kernels in an even layer (enough to cover the bottom of the pan). Put the cover back on and remove the saucepan from heat for 30 seconds (this allows the oil to heat up all the kernels to achieve a near-popping temperature so they all pop at about the same time). Put the saucepan back on the heat. It should begin popping all at once in just a short time. Once the popping starts, gently shake the pan by moving it back and forth over the burner to keep it from burning. Once the popping slows down to a few seconds between pops, remove the pan from the heat (don’t forget to shut off the stove!). Pour the popcorn into a big bowl and season to taste (be creative and use butter, garlic, cinnamon, cheese, or any other seasoning of your liking). And, there you have it! Delicious popcorn for everyone or if you are a little piggy like me when it comes to popcorn - then for yourself! And this can be done on a grill, camp fire as well as your kitchen stove. Now go make some ... you're probably craving some by now! - Just sayin'.